On March 22, a huge mudslide destroyed the small community of Steelhead Haven in Oso, which claimed dozens of lives and blocked access to the town of Darrington. Before the mudslide brought the area national attention, however, Darrington was known for two things - logging and access to amazing outdoor recreation opportunities. From climbing at places like Three O’Clock Rock, rafting on the Wild and Scenic Saulk River, setting out on an adventure in the Glaciar Peak or enjoying an afternoon with the family on the Old Sauk Trail, Darrington has been a gateway for Mountaineers members as long as we have been getting folks outdoors. I drove on the bypass around the slide area just a week before the slide-affected highway was reopened and was floored by the scale of the slide. Reading and watching the news simply could not prepare me for size of the area and the amount of destruction. How do tiny communities recover from such an event? While much of that question must be answered by those who live there, the conservation and recreation community has come together to lend our support. With traffic now flowing in both directions, Darrington is just a 90-minute drive from Seattle. It is surrounded by stunning public lands, with two wild and scenic rivers – the Sauk and Suiattle – and three wilderness areas – the Henry M. Jackson, Boulder River, and Glacier Peak close by. The Mountaineers recognize that wilderness is both about protection of wild lands, as well as connecting people to these places and providing opportunities for the public to learn about natural history and cultural history. Supporting a recreational economy in Darrington both helps a community impacted by tragedy and lays the framework for future conservationists. The Mountaineers are thrilled to continue to collaborate with eight other conservation and recreation organizations, as well as Outdoor Research and REI to put Darrington ‘on the map’ as the gateway to the North Cascades. We are involved in longer-term planning ideas, from continuing to improve hiking trails to establishing mountain biking opportunities, we all believe in the long term potential of the Darrington area. With two breweries recently opened, and a lovely coffee shop, the town does offer of the basics that many outdoor recreationists require. With the support of local businesses, our coalition has produced a colorful brochure map spotlighting recreational opportunities around Darrington. From fishing and camping to climbing, biking and rafting, the Darrington area is a wonderful place to get outdoors! 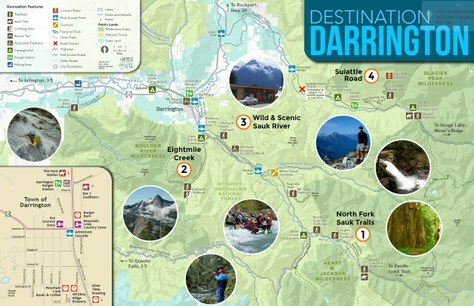 To download the Destination Darrington map visit www.DestinationDarringtonMap.com or pick one up at the cash register on your next visit to REI or Outdoor Research.